Imagine being separated from your mother as a baby. Imagine being forced to work endlessly on someone else’s farm or in someone else’s home. Imagine being whipped when you tried to learn to read. Frederick Douglass experienced all these challenges and more, yet he became one of the most famous writers, orators, and leaders of the 19th century. 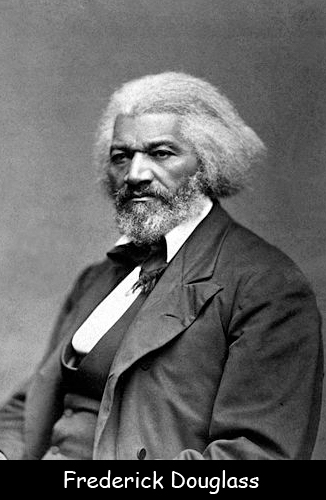 Frederick Douglass was born sometime around 1818 in Talbott County, Maryland. He was born into slavery and no birth record was kept. Frederick later chose February 14 as his birthday. He was taken from his mother soon after he was born. He lived with his grandmother although he occasionally saw his mom. When he was a young child, he left his grandmother’s cabin and went to work in the home of the plantation owner (who might also have been his father). His mother died when he was 10. When he was 12, Sophia Auld, wife of slave owner Hugh Auld, taught Frederick the alphabet. Slaves were not allowed to learn to read, and Hugh Auld forbade his wife to continue teaching Frederick. But Frederick was determined. He asked the white children in the neighborhood to help him read. Frederick read anything he could get his hands on – newspapers, magazines, and books. He said the book The Columbian Orator, a reader for white school children, opened his eyes to new ideas about freedom and liberty. He began to see that slavery was wrong. Frederick began teaching other slaves to read. At one time, over 40 people would gather at a church to learn from him. Slave owners feared that literate slaves would want their freedom. A group armed with clubs and stones came and broke up Frederick’s reading lessons. When he was 16, Frederick was sent to work for Edward Covey. Covey beat him constantly, nearly breaking young Frederick. Frederick finally fought back and defeated Covey. Covey never hit him again after that. In 1838, Frederick escaped slavery. He had tried and failed twice before. Dressed in a seaman’s uniform and carrying fake identification, he made it to Maryland and then Delaware. From there, he went to Philadelphia and finally, New York City, where he stayed at an abolitionist’s home. In describing that time, Frederick said he lived more in one day of freedom than in a year of slavery. That same year, Frederick married Anna Murray, a free black woman whom he had met in Baltimore. The couple settled in Massachusetts. Frederick became a preacher and abolitionist. He wrote an autobiography about his life, which made him instantly famous. He traveled through England and Ireland, talking about abolition wherever he went. Throughout his adult life, Frederick spoke out against injustice. He believed that all men (and women) were created equal in God’s sight and should be treated with fairness and respect. He thought both black people and women should be able to vote. He published several newspapers and books. He spoke at many conferences. After his wife, Anna, died, Frederick married a white woman, Helen Pitts. Neither his family nor Helen’s approved of the marriage. Frederick died of a heart attack in 1895. Watch a video about Frederick Douglass. Declan, Tobin. " All Facts about Frederick Douglass for Kids ." Easy Science for Kids, Apr 2019. Web. 23 Apr 2019. < https://easyscienceforkids.com/frederick-douglass/ >.